Without visiting one of our offices, the E-Ticket, which is different from the paper flight ticket, allows you to purchase your flight ticket through booking a flight in the AIR BUSAN homepage or over the phone, using a credit card. Since all ticket information is stored in our E-Ticket system, you don’t need to worry about a lost or damaged ticket. 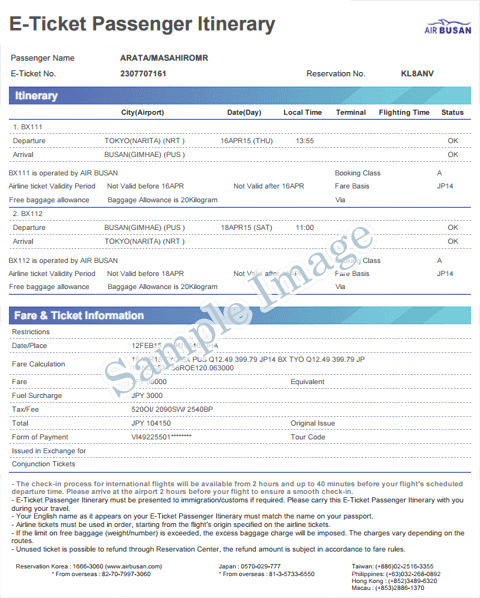 Delivery of E-Ticket and detailed information is by e-mail or fax in the form of “E-Ticket Itinerary/Receipt” . Credit card receipts are also issued through the Online. Please print an itinerary guide sent via e-mail or fax and bring it to check-in. Please keep the “Ticket Itinerary/Receipt” with you throughout your journey, as it may be required during check-in, immigration or the customs' declaration process. If you must go through a specific procedure in order for an E-Ticket to be reissued or refunded upon an unavoidable circumstance, please contact the location of purchase such as AIR BUSAN homepage, reservation center, or travel agency. Reissue or refund regulations for international E-Tickets may vary depending on the conditions of purchase. Thus, certain types of ticket may not be allowed to reissue or refund. Itinerary is an electronic ticket that securely stores all ticket details in the airline’s system. Thus, an E-Ticket cannot be lost or stolen. Print an Itinerary/Receipt again sent by e-mail or receive it via fax. What is Itinerary & Receipt? E-ticket is a certificate replacing a paper flight ticket and it contains all information of itinerary and payment fare.